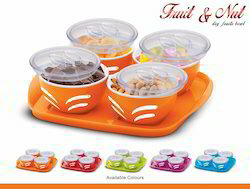 We are a leading Manufacturer of fruit n nut bowl tray set and sweet heart tray set from Vapi, India. Owing to the expertise of our team of experienced professionals, we are able to introduce an exclusive range of Fruit N Nut Bowl Tray Set. Available in 2 Pcs, 3 Pcs, 4 Pcs, 6 Pcs. Our professionals bring forth an excellent range of bowl and tray that are manufactured using premium quality material and latest techniques. In addition, this bowl and tray is built and developed adhering to industry standards. Furthermore, our professionals opt for strict quality inspection made on the bowl and tray to ensure flawless performance. 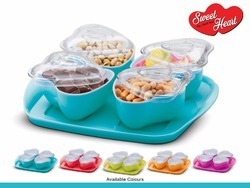 Owing to the expertise of our team of experienced professionals, we are able to introduce an exclusive range of Sweet Heart Tray Set. Available in 2 Pcs, 3 Pcs, 4 Pcs, 6 Pcs. Our professionals bring forth an excellent range of bowl and tray that are manufactured using premium quality material and latest techniques. In addition, this bowl and tray is built and developed adhering to industry standards. Furthermore, our professionals opt for strict quality inspection made on the bowl and tray to ensure flawless performance.